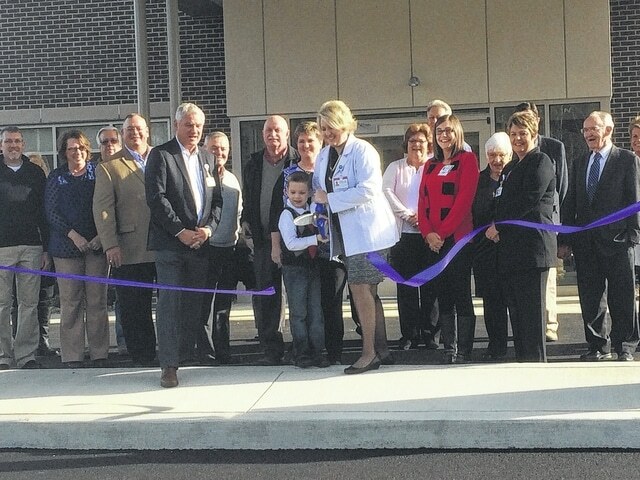 Wayne Allen | Daily Times SOMC celebrated the opening of the West Portsmouth Family Health Care Center with a ribbon cutting, Sunday. Over the course of 2015 Southern Ohio Medical Center (SOMC) has announced various construction projects that would result in the investment of millions of dollars in the community, while enhancing SOMC’s infrastructure. Some of those projects are beginning to come to fruition. On Sunday SOMC celebrated the opening of its West Portsmouth Family Health Care Center with a ribbon cutting. The facility is located on U.S. 52 by Earl Thomas Conley Park. Justin Clark, Administrative Director of Plant Operations at SOMC who oversees all maintenance operations, new construction of building and facilities, said with the opening of the West Portsmouth facility it will be a good resource for SOMC. Clark said with the opening of the facility, people will have closer access to health care. SOMC President and CEO Randy Arnett also believes the West Portsmouth facility will allow for better access to health care. SOMC worked with Tanner Stone Holsinger Donges & Co Architects and J&H Construction Company on the project. Other current SOMC projects include several projects on their main campus and south campus. Clark said in the Braunlin Building there is an ongoing project to expand neurology offices. This project is slated to be complete in early 2016. He said sometime after the start of 2016, there will be a project to expand the second floor of the Braunlin Building to expand Heart and Vascular Services. Earlier this year SOMC broke ground on a $10 million new facility on the the south campus. Once constructed the facility will house urgent care, advanced medical imagining and lab services among many others. It’s anticipated, the current urgent care on south campus will eventually be moved to the new facility. In the meantime will remain open throughout construction. Clark is the goal is to have the new south campus facility under roof by December 15. The project is on schedule and is slated to be open in 2016. To keep up with SOMC construction projects, visit www.somc.org/construction.